If you didn't see our review yesterday, Bandai Namco’s Go Vacation is now available on the Nintendo Switch. The 2011 Wii version of the game followed the success of Nintendo's 2009 release, Wii Sports Resort, but also expanded upon the original idea at the same time. Go Vacation on Switch is a high-definition port filled with over 50 different activities and has an impressive amount of things to see and do at a leisurely pace. If you’re still wondering at this point how it visually stacks up against the original release, above is a comparison video displaying the two versions of the game side-by-side. As crisp as the Switch version looks, it still appears to a bit rough around the edges due to the source material it's based on. 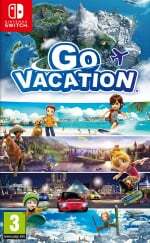 Are you planning on picking up Go Vacation on Switch? Have you already got your hands on it? Are you impressed with the visual improvements? Tell us below. When he’s not paying off a loan to Tom Nook, Liam likes to report on the latest Nintendo news and admire his library of video games. His favourite Nintendo character used to be a guitar-playing dog, but nowadays he prefers to hang out with Judd the cat. There will be plenty of bashing but it has its audience. The Wii version looked so Blurry. Time for Double Dip again ! Btw, for Liam Doolan, "an" HD Wonder, not "a" HD Wonder because we pronounced H like Eight, with E as beginning sound. Same case with "an" hour, not "a" hour. the Wii version is the blurry one, and the switch version is more colorful better looking, and not blurry. minor nickpick. but, i like how bandai remove the white/blue banner thing and change it more transparent instead. it's less of an detraction to see that imo, not really a big issue though. but it's a small nice change for a 2011 game. My eyes caught the trees on Switch version looked better than Wii version, but still..... like folded papers. I honestly have no idea if this is worth buying or not. The game (both on Wii and Switch) didn't get the best reviews, but it seems to have some pretty big fans who are adamant that they deserve better scores. I forgot how nice the music was. I'm really surprised that Nintendo would publish this when they have superior games in their arsenal. Where is Mii Sports at? This is a much welmcome addition, I disagree with the price tag though. It seems pricey for a port that looks like it's between Wii U and switch graphically. If Nintendo wants to port games, I wish they would consider games like Wario Land: Shake It. Something people probably missed out on at the time but would reach a broader audience and maybe help bring new games for the franchise. @Pink_Floyd Yeah, I'll probably get this game when the price drops. Wasting $49 dollars spinning loot boxes is a better use of money that buying this. Now even the 65 Metacritic games get ported over. Go Vacation is still a decent games for my collection. Not as Perfect as Nintendo games since the game was developed by Bandai Namco, but at least there are some audiences who adore this game regardless of Graphic aspects. Metacritic said 65 / 100, i Don't care what they said. I said the Switch version is 7 / 10 due to a little bit better 3D rendering for environments. Have you even tried the game ? Wandering around the Big Resorts is NOT Lame. Lesser Action ? Yes, of course, but that's the point of this game. The games with Relax vibes, like you have a Vacation on somewhere. Switch version looked a little bit better than Wii version, especially the environments. Nah, don't listen to Metacritic or something like that. Trust your heart when you judge the games by yourself. Maybe Metacritic said 65 for Go Vacation, but i said 70, quite good & worthy despite still there are some flaws but still tolerable. This must be 60fps right? @KillerTan98 - It's like, what? The third legitimate casual game? Second from Nintendo in over a year (this isn't counting Labo since... It's in a weird place)? Let it have its moment. I am surprised this came out first than a Wii Sports Resort collection, to be honest. While this game is not my cup of tea... I would consider buying DLC for the original theme over their new one if I were. I'm also impressed that there's such a dramatic difference in the quality. I can't remember if I had this on Wii or if it was We Ski & Snowboard. I'll have to check on the Wii U in case it has the Wii games in the play history. Either way, it's in the post as we speak. It's definitely got something about it. NL gave this game a 6. A six suggests to me that it is not worth the £35/$46 asking price but as a budget price it could be worth a go. There will always be the customer that goes into a store see the box art and thinks I give it a go, it looks fun. This person probably never reads reviews and see graphics as graphics. (I know a few people who can't tell if their TV is set to 'normal ' or HD). But a lot of gamers will make there minds up after reading a review or two. So I guess a review can make or break a game. NL's review says to me, don't waste your cash. You can't score a game a 6 and then not comment on the price being charged. If this was a below £25 game it could fill a summer gap until something bigger and better got released. It's good to see the graphics got a face lift, even with rough edges still showing. But in six months this game will have in the eshop, a 50% discount bringing it down to a reasonable budget price. Unfortunately it will be winter then and it may have lost its appeal. Its just bad marketing. @zool An house, an hamster, an human??? I was super sceptical about this game but my daughter (six) liked the look of it. She's been playing non stop since Friday and claims it's fantastic - apparently you can ride around on a horse, have snowball fights and change the colour of your clothes. Obviously not for everyone but it has its place. @Octane yep, an happy elephant and an hippopotamus went for an hot drink before heading to an hospital after suffering serious burns. @Octane if the first syllable of a word beginning with h is not stressed use 'an'. @JamesR correct. But the drink should not have been served that hot to have caused burns. Maybe they should put in a claim. This is a Bandai Namco game. Nintendo are just handling the publishing outside Japan. where is a real pilotwings at is my question. I don't know about this comparison. Looks like it's showing the Wii over composite. I have my Wii running component and it looks vastly sharper with that showing here. @sword_9mm : A new instalment with motion controls and HD rumble would be sweet. I imagine that Labo support would be thrown in as well. @SenseiReedy We don't have a PM system, and I cannot delete threads. Next time make sure to use the search function to look for existing threads, we're trying to avoid duplicate threads! @SigourneyBeaver I don't think it transfered the journal but you can look in your saves in the wii menu. My brother and I put countless hours into this game so I had to have it for Switch day one. Originally they looked like flat pictures put together crosswise, but the tree trunks have been upgraded to more of a 3D octagon. I haven't had a big issue with blurry edges since the render distance is still SO MUCH sharper than it was on the Wii. The one thing I was hoping they could add in this time was a way to play hide and seek. It could be as simple as letting players disable maps and icons during LAN play, or it could be an official mini game that gives players time to position (hide) their characters then disables their controls while a seeker player looks for them. I've played Go Vacation for a couple of hours so far and it's honestly fun. It's worth the price and will be a great party game. I'm not sure why people expected a GOTY experience....that's not what these games are meant to be. my wife and i are enjoying Go Vacation very much weve been playing it since it was delivered friday afternoon. We never had a wii, only 3ds's, so we never played the original wii version but had we relied just on the review here at NL we would have been turned off, ill never again rely on a NL review like i used to before as this game is so much fun, tho understandably its not everyones cup of tea. we're older gamers but we both love the cool cute vibe of the game. one of the fun things we did was create a bunch of mii's of each other as well as friends and family after i found out that mii's u have created on your switch will show up in the game and they will follow u around as NPCs. we were laughing non stop seeing my wifes close friends inside the game after i created miis of them, she loved it and showed it to them, they laughed too and thought it was so cool and laughed as the miis i ade looked very much like them. we stayed up till 4am playing it last night and after we get some stuff done today we will be back at the game and yea its not a perfect game by any means but its fun and relaxing and theres just so much to see and do. love the exploring and my wife loved the detail as she explored around and was shocked when she stumbled upon a treasure chest, i didnt tell her abotu those i wanted her to be surprised and she was. lots of fun no matter what u do and i can see now why quite a few people have said how much they loved and enjoyed the wii version, im loving the switch version and my wife and i havent been able to put it down and have been laughing and enjoying. i understand some of the complaints about the controls etc but this is a really fun game and theres so much to do. my wife says 10/10 ill say 9/10. this game is really fun and anyone turned off by the sour NL review should get this if they like what they see, theres some youtube clips up they can watch and decide for themselves. Personally i really love this game more than i even thought i would. i hope mario party is great too thats next on my wish list! @Anti-Matter Yes, I agree, this game is certainly NOT Lame. In my opinion the second best game on the Wii after Super Mario Galaxy. The few flaws it has are tolerable, except it not having online. Can we please get an online mode with friends in a future update, Namco. @Ninja44X Your comment is a better review than the ones on here. The original on the Wii got an unbelievably low 4/10. This game is not like the typical Wii shovelware games and has a lot more depth than anything like Imagine Babyz. This game should have been $20 on the Switch. Releasing it for $50 is just ridiculous. Interesting idea but Totally shovelware. So, Go Vacation arrived yesterday afternoon and I've done all the stamps. This is both a blessing an a curse because now I can choose what I want to play from the menu, but I don't need to travel around the map, which I thought was fun. Sometimes it's a bit difficult to find the right way to go, especially on the snow area. Chair lifts help, but a GPS system with a line to follow would also be good. It would make travelling on the map more efficient and less of a chore once the menu is available. Ultimately, while some of the games are a bit wacky, like the glass harp and bucket ball, others have really good physics behind them for a mini game collection. So it's a Wii-era mini game collection that was done properly. It must have sold well enough on Wii to get a second chance on Switch and I think it deserves it. I only ever played Wii Sports which was a total blast.I think that was the most played game on the Wii to be honest and those were the days when family and friends would join in.So would love a game like that for the Switch and this game really keeps nagging at me to buy it. I appreciate your opinion of the game @Ninja44X as well as a few others here but can I just ask you if there are motion controls in the game?can you play it stood up and swinging ya arms about etc or is it just a sit down and use the buttons? @ReaderRagfish dont it was poor on wii with rubbish controls.